The above news story has been flying around the television news and social media this week. It is about a wife in Amenia who gave birth to her son who was diagnosed as having Down syndrome. She didn't want to keep the baby but her husband, who was a New Zealand native, wanted to. This led to the wife divorcing him. The devoted father is now raising funds to help him to take care of the little one back in New Zealand. This story, along with others, which have popped up recently, such as the surrogate parents who left one of their twins - the one who had Down syndrome, back in Thailand with the surrogate mother, make me think about my own reactions when Jessica was born. I am against invasive prenatal testing, due mainly to the high risk of miscarriage, and the fact that I wouldn't abort a baby. I had blood tests and scans throughout my pregnancy. Because of my 50/50 chance of passing on Crouzon syndrome, that was the main objective of all the testing. Yes Down syndrome was mentioned and looked for, but ruled out. Jessica's eyes were wider apart than normal. No other differences were found. There was nothing pointing to Down syndrome. We went into the birth thinking that the baby had a mild form of Crouzon syndrome or just wide spaced eyes which many people have. When I held Jessica immediately after the birth I looked at her eyes looking for Crouzons and a chill went through me. I thought I saw Down syndrome. I didn't say anything to anyone about it. I didn't know until later that Joe had thought the same thing, though he didn't have the chill. During the week in hospital Joe and I would see the obstetrician and paediatrician whispering to each other when they were examining Jessica but nothing was said to us. Upon leaving the ward, the paediatrician queried whether we were taking her to the geneticist which we were in a few weeks time. Once we got home Jessica began to sleep for hours on end and wouldn't feed. We took her back to the hospital and they showed me how to force feed her. Things didn't seem quite right but still nothing was said. At four weeks we took Jessica to see the geneticist. I was in love with this baby. I thought she had a mild form of Crouzons, which was disappointing, but I could cope with it. The geneticist took Jessica, placed her on the examination table and began to move her arms and legs like we had seen the paediatrician doing. She then sat and looked at me and asked, "What do you think the baby has?" I told her, "Crouzons". The geneticist then proceeded to tell Joe and I that she thought Jessica had Down syndrome and she was surprised that no one had diagnosed it. At the word Down syndrome my memory spiralled back to the birth when I had looked at her little slanted eyes. I had been right! The geneticist proceeded to tell us about the different types of Down syndrome. It was all a blur. I felt like a block of ice. Surely this wasn't happening! Finally the geneticist went on to tell us that she could also have Crouzons as it is a different chromosome that is affected. It was all too much to hear. We took Jess to have bloods taken for the genetic testing. It was on the way home that Joe and I revealed to each other that we had thought she had Down syndrome at the birth. We just hadn't vocalised it. The results for the Down syndrome would be known the next afternoon. The Crouzons test would take a few months as it had to be sent to Sydney. At home I fell apart. How could this happen? I already had two children with high medical needs. Why did I now have a child with Down syndrome? I was angry, I was terrified. I didn't want to look at Jessica. I didn't want to feed her. I didn't want to touch her. I felt just like that woman in the story above. The only difference between me and the lady in the story was that I wasn't going to give my baby away. If she had been diagnosed after the birth I wouldn't have wanted to give her away either. She was my baby. She grew in my womb and I was her mum. She knew my voice and I knew her kicks and cries. I just needed time to come to terms with the news I wasn't expecting to hear. Four weeks is a long time to not know that she had Down syndrome. Down syndrome is normally diagnosed quickly. I was so shocked at my reaction. It confused me. It revolted me. As a teacher I had taught children with a variety of special needs (no Down syndrome)... so where did this presumption that this was a really bad thing for a baby to be born with, come from? I didn't know anybody with Down syndrome. I didn't know anybody who had a child with Down syndrome... So why did I feel this way? The only conclusion I could come up with, was society told me. The next afternoon a phone call confirmed what I was praying not to hear. 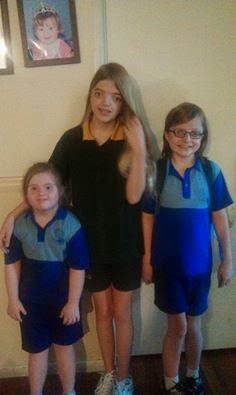 Jessica had Down syndrome and the 'worst' kind, Trisomy 21 where there were three of chromosome 21 in every cell. There was no counselling. Just a, "I've rung the Down syndrome Association and they will send you a new parent's pack". That was it! Someone from the association was supposed to contact us but we never heard from them. Joe coped with the news fine. He had a cousin with DS so he was okay with it all. His positivity even made me angry. I dissolved into a bucket of post-natal depression. I couldn't look at 'normal' babies, particularly those born around the same time Jess was. I was angry. I was mourning. I couldn't even look at the new parent's pack. I had a real mental battle going on. I had to keep reminding myself that Jess was the same baby who I loved before the diagnosis. Nothing had changed, except she now had a LABEL. That label also explained her sleeping and feeding issues. It gave knowledge. I had to go through the mourning process which took over a year to truly accept what was. This amount of time is normal and in fact the mourning process can take a lot longer for some people. What had society told me that I should be so scared of?... The intellectual impairment. I had picked up somehow from society, that people who have an intellectual impairment are less than human, that they don't deserve the same rights as people with average or above intelligence. That they won't have a 'good' life. This is all total rubbish. Now that Jessica is older, I can say passionately that this is wrong! Yes she has an intellectual impairment and she has low muscle tone. These two symptoms mean it takes her longer to learn SOME things (notice the word SOME). But Jessica is a little girl. She loves, she cries, she gets angry, she fights with her siblings, she plays, she has her favourite tv shows and pop stars... Jess has an amazing vocab and very good speech. She has an uncanny memory for faces and songs. She loves imaginative play and magic. She loves to swim. Yes Jessica did need to have therapies when she was little but so do many other children. Yes she does need extra help with things but so do many other children. I see life in a different way when I look at it through her eyes. Life is about love and laughter. It is about being carefree and learning at your own pace. Why children with Down syndrome are on the 'allowed to be aborted' list is beyond me. It reminds me of the genocide of the Jews by Hitler. The Jews weren't perfect so the Nazis tried to eradicate them. People with Down syndrome aren't perfect so they can be eradicated too if the parent so desires. I could not imagine my life now without Jessica. She is the apple of my eye. Every morning and afternoon she runs to me with a, 'HI MUM', a huge smile and a hug. I feel like a queen and she is my princess. Every day she makes my heart shine. Yes my baby girl has Down syndrome, but she is NOT Down syndrome. She is Jessica first and foremost. I am so glad that the father did not abandon his son, and that people around the world are lending their support. I also pray for the mother who was filled with fear and her society's prejudices. 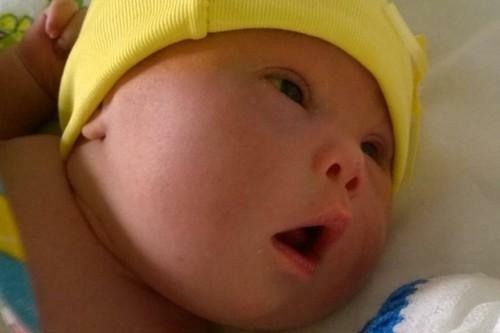 The more of these stories the world hears and cares about, that place value on babies born with Down syndrome, will help to change current attitudes... and that's a good thing!